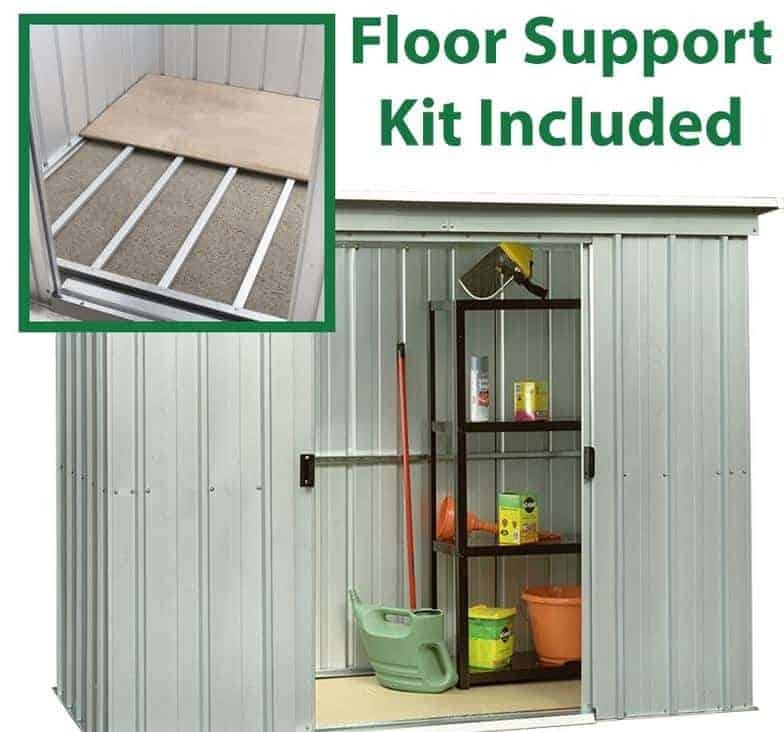 The 6’6 x 3’11 Yardmaster Pent Metal Shed 64PZ+ With Floor Support Kit is one very well designed, good looking and practical shed that has a number of great features which will make it an ideal purchase for any style of garden. 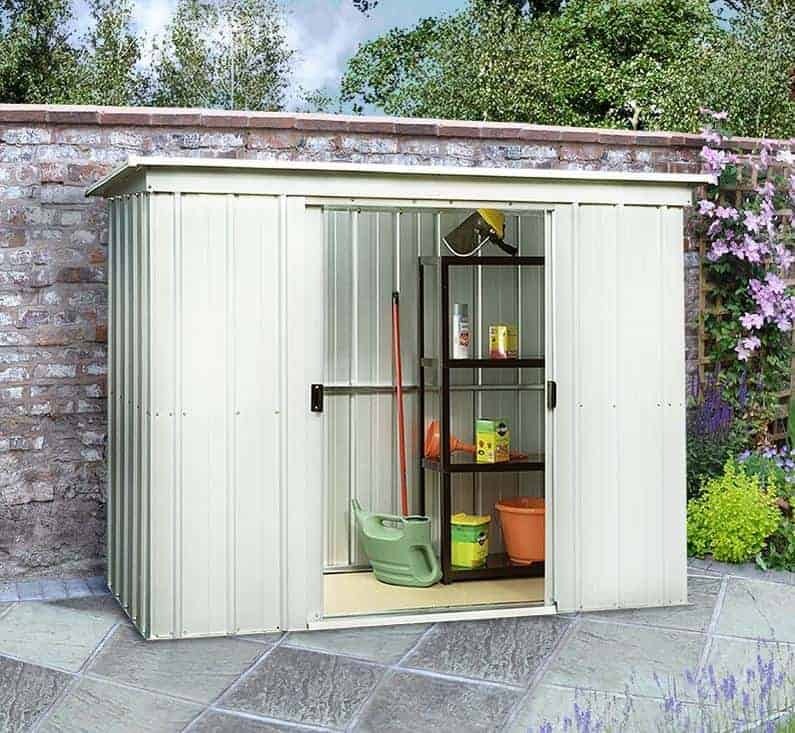 With a very industrial and modern appearance, this is a shed which has a look and style all of its own and it will certainly give your garden a bit of class along with some extra storage space. 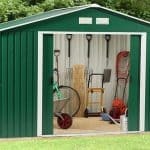 The storage space you have here is more than enough to protect your tools from the rain, stop the kids leaving things all over the garden lawn or even provide a way to remove some of the clutter you have inside your home. Some of the key features of this shed are those huge sliding double doors. These doors offer you a lot of room to get in and out of the shed and they look great in the process. The gorgeous zinc plated steel is protected by this high quality, clear resin bonding which does a great job at making sure the shed will still be standing for many years. This is a shed which will certainly look great all the while offering you some generous storage space. 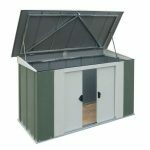 Wow, the Yardmaster Pent Metal Shed certainly ticks all the boxes when it comes to having all you need to make sure your items are kept safe and away from the rain. This shed offers you what we feel is a very generous amount of space for storage. The width in particular is great, offering you 6 feet 6 inches of space along with 3 feet 11 inches of depth. This gives you more than enough space to keep things like your tools, lawn mower or even just general storage of those items that are starting to clutter up the spare room of your house or are spilling out of the cupboards. The height of the Yardmaster Shed may not be the tallest, but at its highest the shed does offer 5 feet 9 inches which is enough to get your things in and out without making it uncomfortable to do so. While the dimensions of the shed are something we like, we do really love just how great and rather different in general this shed looks. Yardmaster have opted for a pent style roof and that is a design choice we are very happy with. This kind of roof gives you a lot of protection from the rain and the way that it slopes to the back means the rain will run off the back so if you are having to get something out in the rain you will not have to worry about having a waterfall running on you from the roof. The roof is made from the same type of steel as the rest of the shed it and has been given a coating of clear resin bonding. You cannot really see this, but it does a great job in not just keeping the rain out, but also making sure it lasts for a long time. From a distance the walls of this shed do look like wood and that is something we really like, but when you touch it you can feel just how strong this zinc plated steel that Yardmaster have used is. It offers your belongings just a huge amount of protection from the rain and just like the roof it has a clear resin bonding finish to ensure it will not rust and be able to keep your items protected for many years. To be honest this type of zinc plated steel is not something we have seen too often before, but we really could not be any more pleased with how it looks, how strong it is and also how it manages to help keep the costs down so this can be a low priced shed. 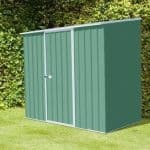 Like most other sheds that are made out of some kind of steel or metal, the 6’6 x 3’11 Yardmaster Pent Metal Shed does not have any need for a frame. This is because the materials that have been used to make the walls are strong enough on their own and when placed together they offer you a very rigid and sturdy structure that is going to be standing strong for a very, very long time. Now when it comes to the flooring of this shed, there is quite a bit to discuss. You see this does not actually come with a floor. This shed is designed to be bolted to a strong and secure surface like paving for example. You can just use the surface it is bolted to as the floor or you can put in your own flooring. One really cool thing that Yardmaster have done here is include a floor support kit which will make it easy for you to add in a wooden floor if you so desire. The resin bonding that Yardmaster have used here is truly amazing and something we would love to see other shed manufacturers make use of. 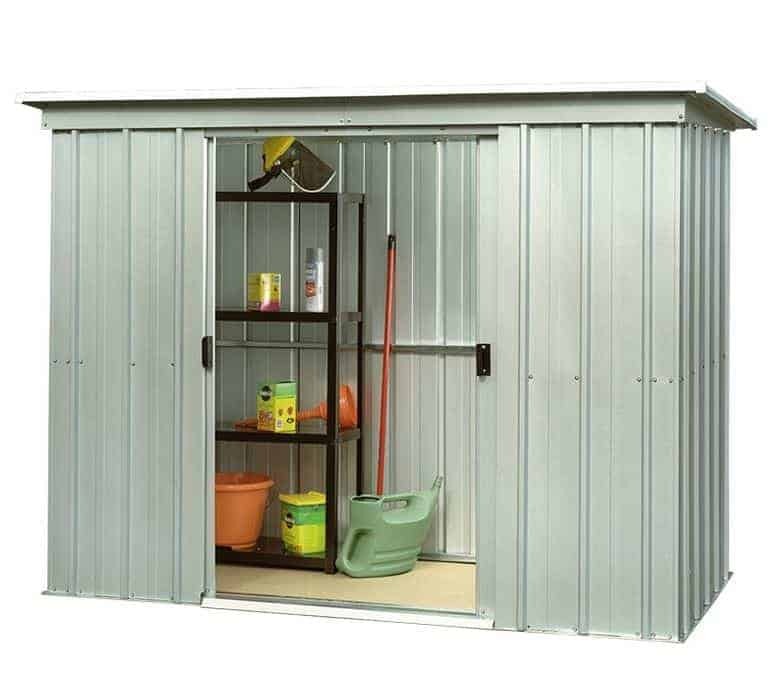 This makes the Yardmaster Pent Metal Shed a shed that is low maintenance. Actually an occasional wipe down is all you need to do. There is no need for you to treat this shed whatsoever and that is something we certainly class as a plus. 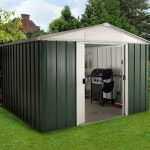 You will get a ten year guarantee against rust and when you consider that is all that can really go wrong with this shed then that is one awesome guarantee to have. Because of the way the shed has been designed and how well that resin based bonding protects the steel. We feel that this shed could easily go 20 years without showing any kind of problems. One of the standout features of this great storage shed are the doors. You have a great set of double doors on here that will allow you access to the shed to get things out and put items in. The doors when both open give you 5 feet 2 inches of height along with 2 feet 7 inches of width. This makes getting your mower or even putting in a set of shelves for storage very easy. The thing though that really sets these doors apart from other sheds is that these are sliding doors. Not only do they look cool (and we are sure the first day you have this you will spend at least a good ten minutes sliding them open and closed), these sliding doors require no hinges which means there is never any danger of them falling out of place. There are no windows on the shed which at first may raise a few eyebrows, but we feel that windows would have added to the cost and really not have worked out with the design. Those sliding double doors, as well as looking incredible and being a lot of fun, do actually provide a great deal of security. There is no locking mechanism on these doors however so if you do plan on storing something that is expensive then you will want to add some kind of padlock to keep everything secure from thieves. This can be done very easily and you can pick up a padlock or some other style of lock for very little money. With the doors securely shut there is no way for people to know just what you have inside here. This is another reason as to why we are happy that Yardmaster decided against having windows on the shed. If you want to customise your shed then this can be done with the flooring inside as it will be up to you what if any kind of flooring you use. This style of shed is not suitable to be painted, but the colour, we feel, will fit in with most gardens. When it comes to extras this shed actually does come with the floor supports which most other manufactures would charge you for as an extra. This is really cool and no matter if you decide to add flooring or not we love how they are including this for free. 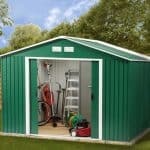 This may be a relatively low priced shed, but it is still very high quality and we are sure many people will be surprised at just how strong and sturdy the shed is. Zinc plated steel on its own could do a great job in standing up against the elements, but with that added protection the resin bonding gives you, you will have a shed that lasts for well over ten years. At six feet wide and over 3 feet deep, you will be able to store many things in here. One way to make great use of the storage space available is with some shelving to help give a little more floor space. It should take two people no more than a few hours to put this together. Just make sure you have the tea and cakes on hand to save any unnecessary kitchen breaks. While you may have to add in the price of some flooring down the line, we still feel that at under £200, you are getting a lot for your money here. Good storage space and long lasting materials make this very good value for money. 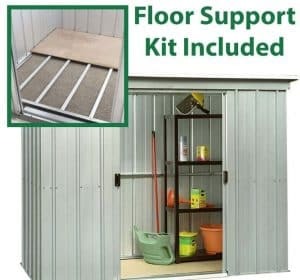 Final Thoughts: We are very impressed with the 6'6 x 3'11 Yardmaster Pent Metal Shed 64PZ+ With Floor Support Kit. To start with the zinc plated steel has a very great look to it and will be up to the task of lasting many harsh winters and wet summers. You get a good amount of storage space and while it does not come with a floor, if you are bolting this down to a concrete area then you may not need one anyway. 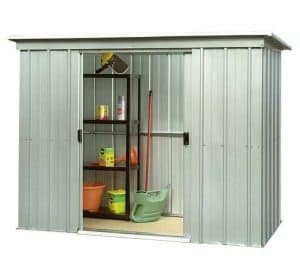 In all we feel that this shed offers you a low cost way to add some good looking storage space to your garden.